Sabarimala vratha is observed by the devotees after wearing a maala bearing the Ayyappa mudra. They usually wear black dhothi and shirt and observe complete celebacy. It is normally done in the month of Kanni as the vratha period should last for 41 days i.e. a Mandala. So that one can go to Sabarimala on the very first day of Mandala Pilgrimage season which normally falls on 16th or 17th of November. Pilgrimage season in Sabarimala starts from mid of November to mid of January. Ayyappa devotees wear a mala to mark the begining of their vratha for Sabarimala pilgrimage. 'Maaladharanam' is aimed at the entire change in the daily life of the pilgrim. It is for concentrating the mind on Dharmasastha, the symbol of all virtue and purity. Each devotee is called 'Swami' as he is considered pure and dedicated. Now-a-days, for convenience, the pilgrimage starts to Sabarimala from the first of Vrischikam, and Maaladharanam is done from about the twentieth of Kanni. It is for doing direct penances for minimum of 41 days before the pilgrimage. After Maaladharanam and before the pilgrimmage, one has to turn towards piety by visiting many temples and taking bath at several holy places. He should recite Keerthanas and prayers and do poojas, offering his mind to God. 'Swamiye Saranam Ayyappa' should be chanted at least on two occasions a day. Blue, black or saffron dhothies are selected by the Swamis to wear. Normally pilgrims wear black cloth. Those who have completed 18 successive years of Sabarimala pilgrimage are treated as Guru Swamis and they wear blue cloth.This practice varies from place to place. 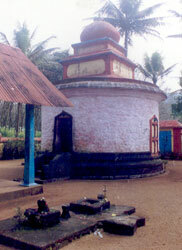 During these days, the Swamis take bath before dawn and wear the sacred ash or Vibhuthi got from the nearest temple. It symbolises a retreat from worldly life by offering the mind to God. Pure Brahmacharya (celibacy) is to be practised by a Swami during the entire pilgrimage period. It is to be done in word, deed and thought. Only vegetarian food, instantly cooked, and fresh fruits are to be eaten. The Swamis should sleep only on matresses avoiding pillows.Some people abstain from using chappals in order to prepare the soles of their feet to climb the Sabarimala hills barefooted. During the whole period of the Vratham, the pilgrim has to practice Satyam, Ahimsa and simple life. Yama and Niyama should all be practised. A Swami ought to be'Nishkama and Nishkrodha'. A Swami should love all. He must be the embodiment of chastity and charity -- in short all the good human qualities. All these direct penances purify the body and mind of the devotee. Thus undertaking all such hardships for the pilgrimage, his mind reaches the divine peak (Mount Abora) by chanting the name of Dharma Sastha. It is said that chanting the name of the Guru is equivalent to chanting the name of Lord Shiva, Guru's abode is Kashi Shetram and water used to wash Guru's feet is Ganga. 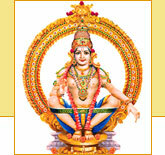 The role of the Guru is significant in the Ayyappa cult. The Guruswamy is usually an elderly person who has undertaken pilgrimage to Sabarimala not less than seven consecutive years in the traditional long route and had darshan of Makara Jothi. The devotees treat the Guruswamy as Ayyappan himself. It is important that pilgrims gain knowledge from the Guru on all the aspect of the Pilgrimage. One should serve the Guru physically, mentally and verbally.